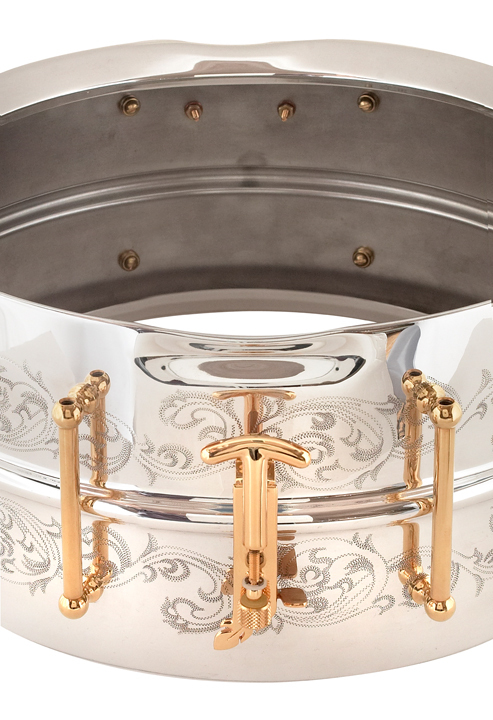 The JNDC Elite Series represent the pinnacle of JNDC instrument design in both art and function. 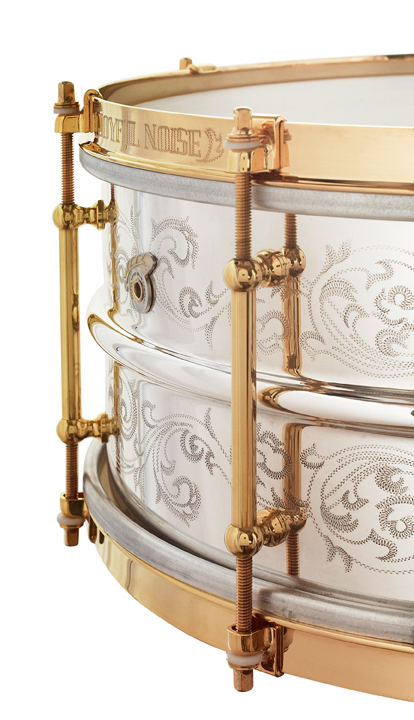 Similar to the Winged Elite, Scrolled Elite, and Majestic Elite, the Esprit Elite metal snares are inspired by the vintage snare drums of the 1920’s and 1930’s, which were accented by intricate hand-engraved scroll or panel patterns. 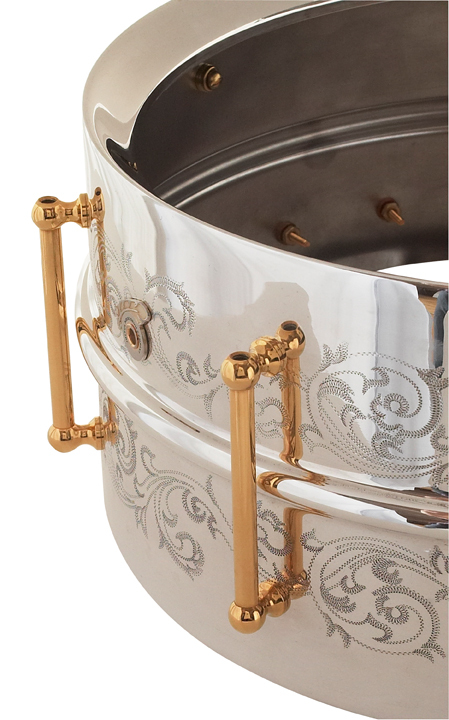 The JNDC Esprit Elite is exquisitely faceted in a hand-engraved feather motif scroll adorning the drum in a mirrored fashion above and below the center bead. 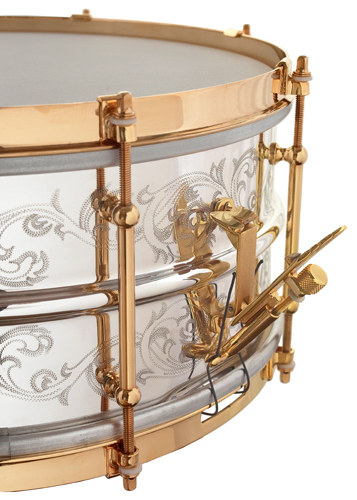 Unlike the Winged Elite and Scrolled Elite, which are plated in lustrous black nickel, or the Majestic Elite plated in 24k gold, the Esprit Elite is plated in pure silver and accented with 24k gold-plated hoops and hardware components. 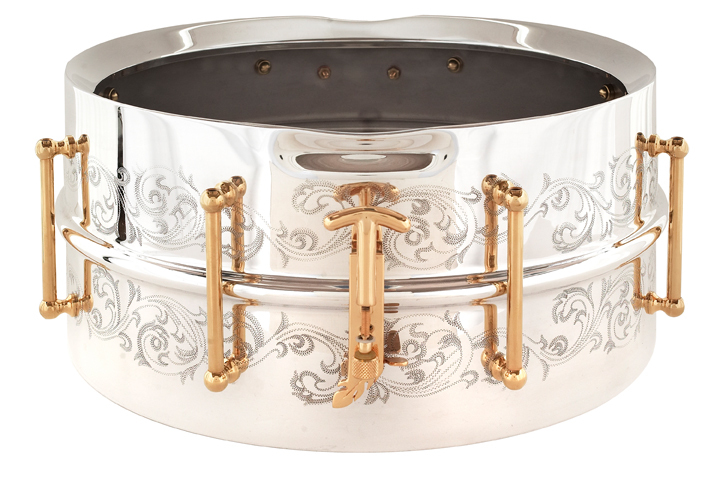 These extraordinary drums are hand-engraved by the world-renowned master drum engraver and vintage drum historian, John Aldridge, who painstakingly renders the scroll design to life, never engraving any two drums the same. 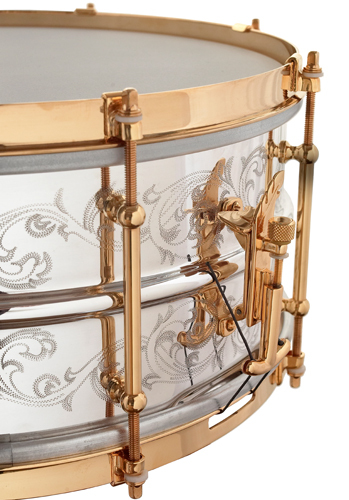 Each drum is truly one-of-a-kind, both aesthetically and sonically. 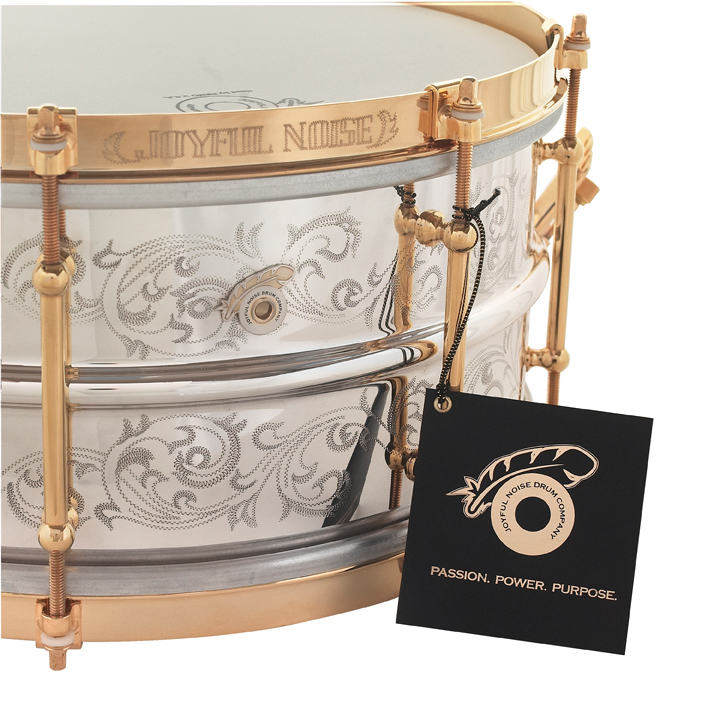 Hand-selected for their increased mass and density, these seamless brass or bronze shell drums are extremely musical and “bell-like” in their tonal quality, yet very articulate and focused in their responsiveness. 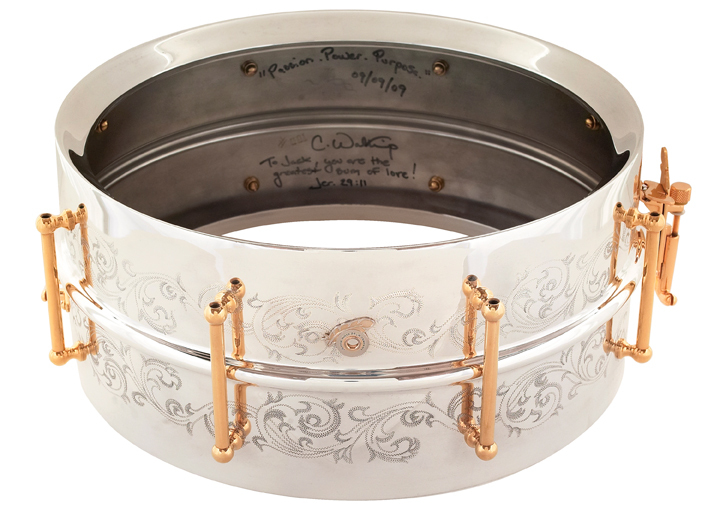 Once the shell is hand-selected, the bearing edges and snare beds are finished by hand in order to refine and optimize the sonic performance. The brass shells will tend to be more colorful in their high-end register and harmonic series, resulting in extraordinary vibrancy. The bronze shells exhibit powerful mid-range and low-end frequencies, translating into increased focus and presence. The Esprit Elite possesses an explosive power that is literally felt, as well as, heard, making it ideal for both recording applications and live performances. 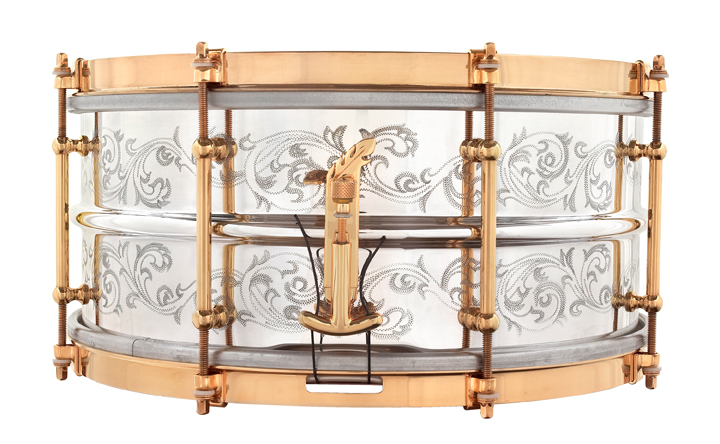 The Esprit Elite model design and hardware consist of 2.5mm solid brass hoops, ten solid brass Corder tube lugs, bell-flanged bearing edges, vintage-inspired crimped snare beds, 24k gold-plated brass JNDC feather motif drum badge, and the proprietary cast bronze JNDC “One Touch Classic” snare drum strainer (throw-off) system. 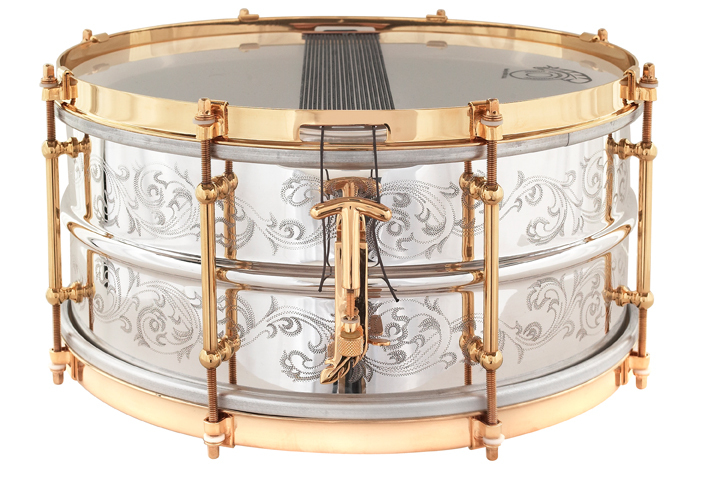 A certificate of authenticity, serialized lapel badge, JNDC Strainer Tutorial DVD, and a complimentary embroidered soft shell case accompany each instrument. 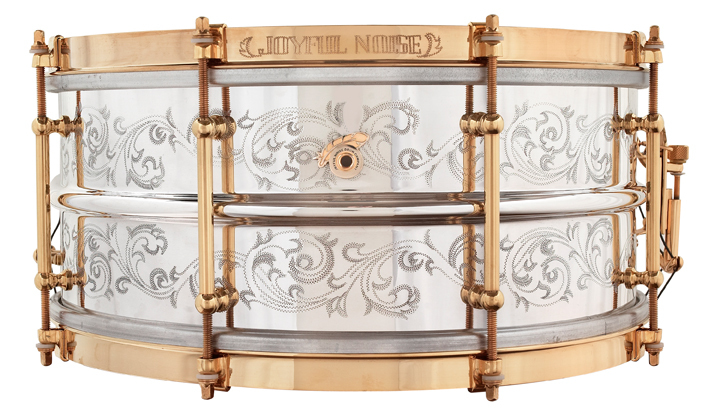 The JNDC Esprit Elite is available in 6.5x14, 5x14, and 4x14 sizes with the choice of single or triple flanged hand-engraved hoops.